MT4 Supreme Edition (MT4SE) is our latest Add-On for MetaTrader 4 platform (MT4). It allows you to make use of new advantageous trading features in form of Expert Advisers and Indicators, bringing the software to a higher level. Let's call it "tuning" of the MT4 - with over 60 free utilities to boost your trading experience! Admiral Markets is proud to present a new exclusive feature - the Tick Trader! This innovation will become available on 19th of January 2014 and will definitely amaze by its efficiency and is certainly able to enrich your trading activities. We are always looking out for our clients' wishes and this Add-On has been specially designed to meet the needs of active day traders and scalpers. You will get the most out of it in fast market conditions when your trades need to be executed instantly. Multi monitor experience: open as many tick charts as you wish and move them around your screens, they are detached from platform! Combined features: you can run several Mini Terminals on the top of several tick charts! Downloadable ticks: now you can collect tick data and store it on your PC! Tick Chart, which is already implemented in the MT4, is quite simple - one tick chart at a time, no trading functionality, no advanced features. Our new improvement offers you everything you may have requested in the past, if you were asking for tick charts! The trading functionality of the Add-On is designed for people who want a quick entry/exit in trading. In Mini Terminal, you can place orders in a blink of an eye using a mouse and even faster with a keyboard! For quick order entry you can click on the Bid and Ask prices (Sell and Buy orders respectively) in the bottom-right of the app. For extra-fast entry / exit, use the Ctrl key + one of the action keys (B - Buy, S - Sell, C - Close). Please note: Hedging through the Tick Trader is not allowed. For example, if you place a Buy order and then a Sell order, then the Sell closes the previous Buy. Ticks chart: shows each change in the Bid or Ask price. Tick-speed chart: shows each tick, plus grey bars indicating the time between tick. Timed chart: show each individual tick, but the x-axis of the chart is divided into equal amounts of time. Tick candle: shows traditional candles – with an open, high, low, and close – but based on a number of ticks rather than duration of time. Feel free to collect tick prices! The tick chart is activated as of starting the application and by clicking "Download" button you will get the entire available tick history for the selected symbol, such as the date, Bid and Ask prices. The variety of Indicators and Expert Advisers is large, and testing them takes a lot of time. Admiral Markets has collected the best, most useful features with a user-friendly interface, making you able to use them from day one. The rest of the features we will leave up to you to discover! Enjoy the enhanced trading experience with the newly upgraded and exclusive MetaTrader 4 Supreme Edition for Admiral Markets' customers - happy trading! Disclaimer: Any new technical solution is recommended to be tested personally. 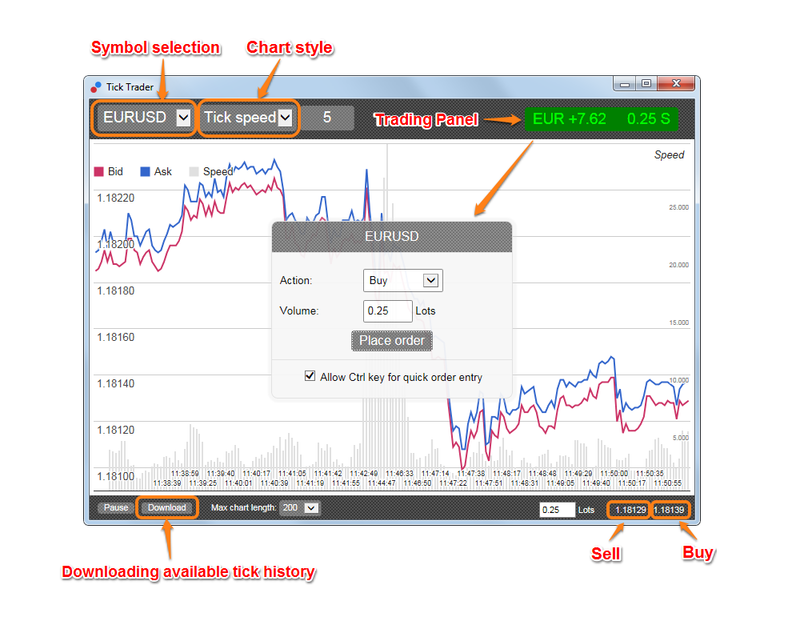 Please familiarize with our advanced tools in demo environment before trading with your real trading account. MetaTrader 4 Supreme Edition is a third party software and Admiral Markets shall not be responsible for any malfunctions therein. Please also note that any Expert Advisor will only run if MT4 platform is active, your account is connected to our server and AutoTrading is enabled in options. For more information on the MT4 Supreme Edition's Tick Trader, please familiarize with the following manual. Warning: Trading foreign exchange or contracts for differences on margin is speculative in nature and could involve the risk of loss. Such trading carries a high level of risk and may not be suitable for all investors. Before using the service please acknowledge the risks associated with trading.